Suit Construction — De Oost Bespoke Tailoring - authentic tailoring and personal attention. 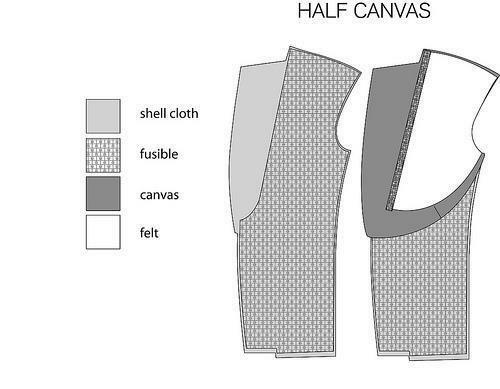 The construction of your suit: Full Canvas, Half Canvas, fused, unlined, deconstructed or different? De Oost Bespoke Tailoring is a house of craft and passion so we can tailor using several ways of construction. This is a short explanation about the 4 common methods used by Bespoke Tailors. The canvas lining allows the suit fabric to drape naturally, allowing a clean, well put-together look. It takes years of training and additional hours of handwork for a tailor to be able to craft this the correct way. Between the two extremes (fused and full canvas) lies a compromise – the half-canvassed jacket. Half-canvassed jackets have canvas material running only through the chest and lapels of the coat. Past that point, the jacket is fused. Half-canvassed jackets have several benefits. First, they generally have a lower price than a similar fully canvassed jacket. Less handcraft means a lower overall cost to you. And because the top half of the jacket is not fused you’ll not run into any bubbling problems as you might in a fused jacket. This adds to the lifespan of the garment. Finally, the canvassing provides the proper base for the jacket to drape naturally across your chest, rather than appearing stiff and lifeless as many fused jackets do. When your suits aren't just for business and formal occasions then having them tailored Unlined or Unstructured is a good option. It gives the wearer the most natural look and freedom of personal expression. By removing the interior lining, shoulder pads, and the canvassing, the jacket wears more like a shirt than a suit coat. This allows for more movement - comfort, a more casual appearance, and a more natural silhouette for the wearer - all of which help bringing the jacket down to the less formal level of the wardrobe. More often than not it is seen on lighter, summer-weight fabrics. Part of it because lighter weights of wool and materials like cotton and linen are more prone to wrinkle in the first place, another reason is that by removing the lining it allows the jacket to wear much cooler. Natural fibers breath but this is obstructed by the satin lining, even a light-weight jacket with a full-canvas construction wears much warmer in the summer. Many suit manufacturers no longer use a canvas interlining in their jackets. Rather, a fusible interlining is glued to the wool shell of the suit. And while this does an adequate job of keeping a jacket’s shape, it often creates an unnatural stiffness in the jacket, making a fused jacket appear lifeless compared to a similar canvassed coat. Differences: In the full canvas Jacket, you can see how the jacket is composed entirely of cloth and horsehair canvas. The fabric is stitched directly to the canvas. In a half-canvassed garment, fusible extends the entire length of the coat. However, the garment is stitched to the canvas material, assisting in the proper shaping and providing life to the coat. In the fused jacket all the way to the right, the fusible interlining is glued the entire length of the coat. If you want to know what the best construction would be for your garments and your personal style needs/ideas? Then feel free to contacts us for personal advice. Bespoke Tailoring is so much more then a method. It is about passion, respect and creating a unique experience. This so you look and feel as you wish and prefer.